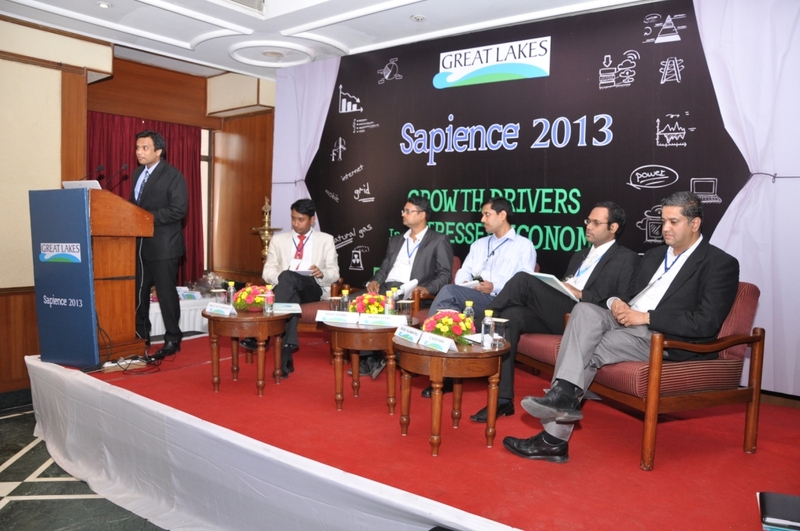 Great Lakes Institute of Management, Gurgaon held its Annual Management Conclave ‘Sapience – 2013’ at the India Habitat Centre, New Delhi on 23rd September,2013. 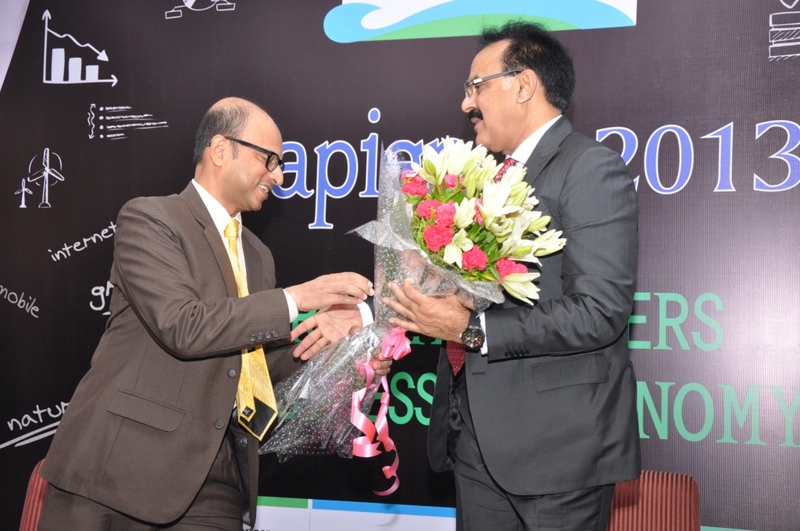 The Conclave was graced by Dr. Arvind Mayaram, Secretary Economic Affairs, Ministry of Finance, Government of India, as the Keynote Speaker. The Conclave also saw 21 eminent industry leaders participating in panel discussions on key areas for growth and opportunities in this challenging economy. India Smart Grid Forum (ISGF), Bridgei2i and Evalueserve were the knowledge partners for the Conclave and Mint the Media partner. The guests were welcomed by Mr. Mohan Lakhamraju, Vice Chairman – Great Lakes Institute of Management and Dr. Himadri Das, Director – Great Lakes Institute of Management, Gurgaon. 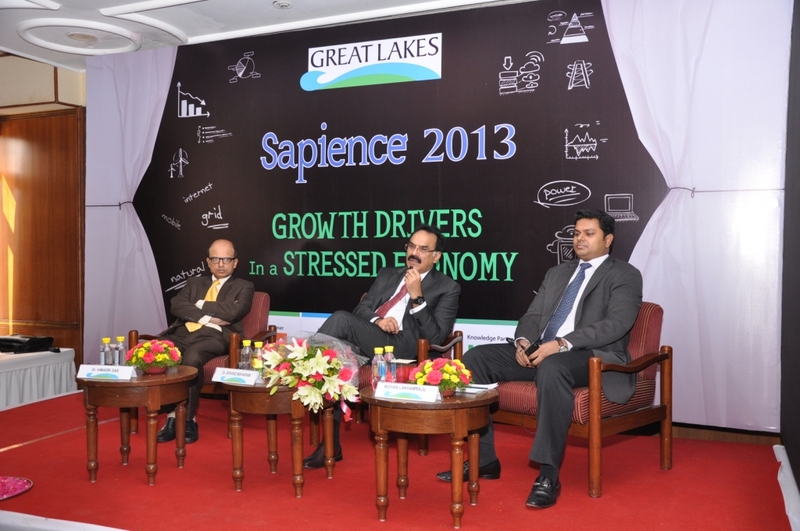 Dr. Arvind Mayaram delivered the keynote address on the theme ‘Growth Drivers in a Stressed Economy’. With his vast experience as an administrator and as key economic policy maker, Dr. Mayaram, focused on the key macroeconomic indicators related to the recent volatility seen in the markets, depreciation of the rupee, Current Account Deficit (CAD), Fiscal Deficit and Inflation. He said that on each of these indicators the situation is completely under control and that the Government has done its arithmetic and taken measures to rein these in. Dr. Mayaram expressed a strong belief that the growth would return to its potential level of 8 per cent on account of greater investments in the country and said the investments were likely to pick up because of the large projects that have been cleared by the Cabinet Committee on Investment. Most importantly, Dr. Mayaram was a harbinger of hope that things would get better in the future. The keynote address was followed by four panel discussions by industry leaders on the four possible growth drivers for the Indian economy – Smart Grids, Natural Gas, Internet & Mobile and Analytics. Each panel had 5-6 senior industry participants with one of them moderating the panel and each panel discussion was preceded by a presentation by a Great Lakes Gurgaon student to create a background of the discussion with a review of the state of the art. This panel focused on smart grids that can balance loads and shift demand to create smoother demand curves that are aligned with power supply. 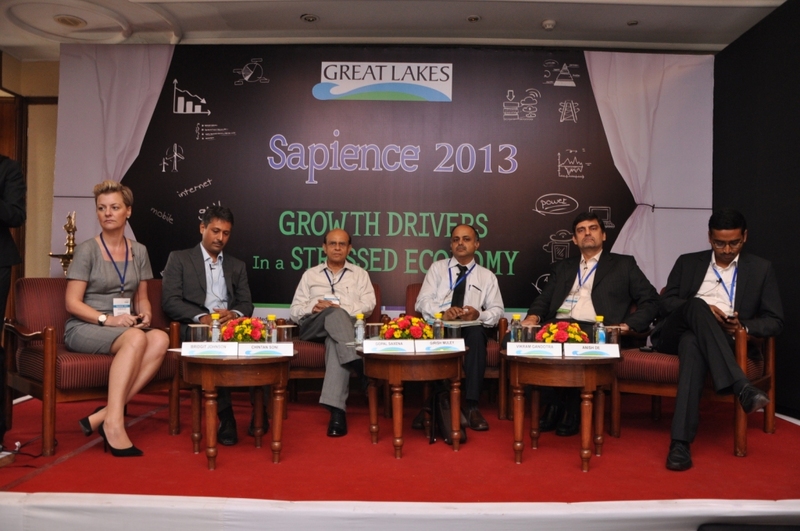 “Will power availability be a key driver of growth across sectors?” was the question which was answered by the panelists. The panel also discussed the need, practicality and challenges of implementing such schemes and opined that smart grids with a focus on demand response can shift peak demand to different times of the day to get a smoother load curve that is more aligned with power generation. The panel said that this would go a long way in alleviating the power shortages faced during peak demand and reduce the pressure on increasing generation capacity. The panel comprised of Bridgit Hartland Johnson, Managing Director – Energie Dynamique, Anish De, CEO Asia – Mercados EMI, Chintan Soni, Co-founder and Director – Ecolibrium Energy, Girish Muley, General Manager (Solutions, Energy & Utilities) – IBM India Pvt. Ltd., Gopal Saxena, CEO – BSES Rajdhani Power and Vikram Gandotra, General Manager (Marketing) – Siemens. The panel discussed the effect of the proposed domestic natural gas price increase on driving investments in exploration and production that would in turn increase the availability of domestic natural gas and change the energy mix in the country to a cleaner fuel basket. 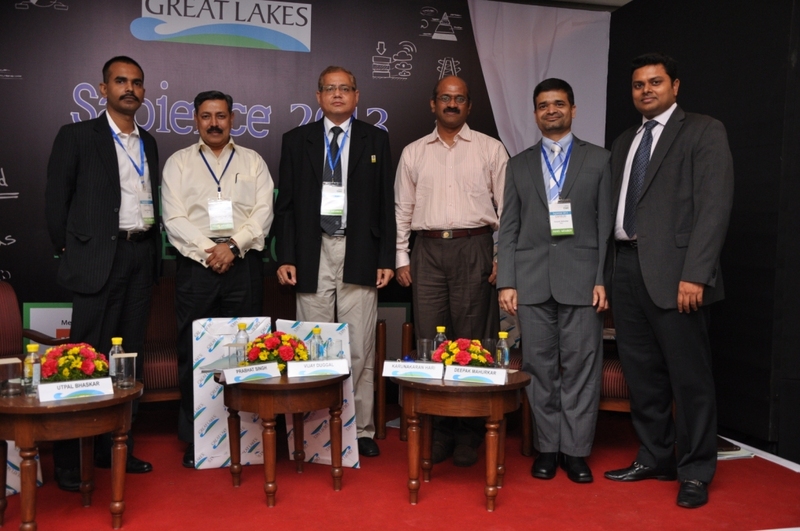 The panel also discussed the success and desirability of piped natural gas as a substitute for LPG cylinders. The panel comprised of Utpal Bhaskar, Energy Editor – Mint, Deepak Mahurkar, Director and Leader (Oil & Gas) – PWC, Karunakaran Hari, Head (Commercial) – Cairn Energy India, Prabhat Singh, Director (Marketing) – GAIL and Vijay Duggal, DGM (Commercial) – BPCL. The panel witnessed the discussion on young India’s growing appetite for consumption and its overwhelming preference for the internet and mobile as the platform of choice for everything from information to commerce to socializing. The panel discussed the evolution of the Internet and mobile space and the current large categories of search, classifieds, travel, e-commerce, and a whole plethora of social network centric business models and was of the opinion that the future of this sector was likely to witness disruptive business models driven by rich media, mobility, localization, and digital payment systems. The panel comprised of Ankur Warikoo, Head – Groupon APAC, Anurag Saran, Vice President (Product) – Yatra, Apurva Chiranewala, Head (Strategic Alliances) – Snapdeal, Vivek Jain, Executive Vice President (Naukri Product & Analytics) – Info Edge India Ltd and Sriram Jagannathan, CEO, AIrtel mCommerce Services (joined through Skype). The panel discussed the deluge of data facing businesses today, huge volumes of data coming in at a high velocity from a variety of sources – the dawn of big data. The panel was of the opinion that this presents a huge opportunity for analytics to deliver actionable insights from this data that could drive competitive advantage for companies. The paucity of trained professionals to exploit this opportunity was discussed as a key challenge. 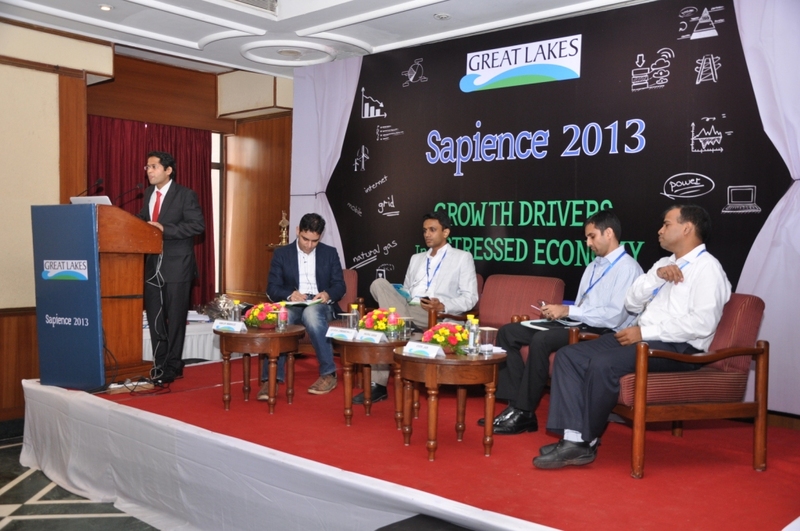 The panel comprised of Sanjoy Roychowdhury, Vice President – Evalueserve, Anurag Verma, CEO – fnMathLogic, Ashish Sharma, Co-founder and Director – Bridge i2i, Raghu Yalamanchili, Associate Director – Mu Sigma and Sivaramakrishnan Narayanan, Partner (Business Analytics, GBS) – IBM.